Springfield Punx: Fellow Punx! I Need Your Help! Hey guys! I don't do this much, but I was wondering if you can take a couple minutes to help me out. 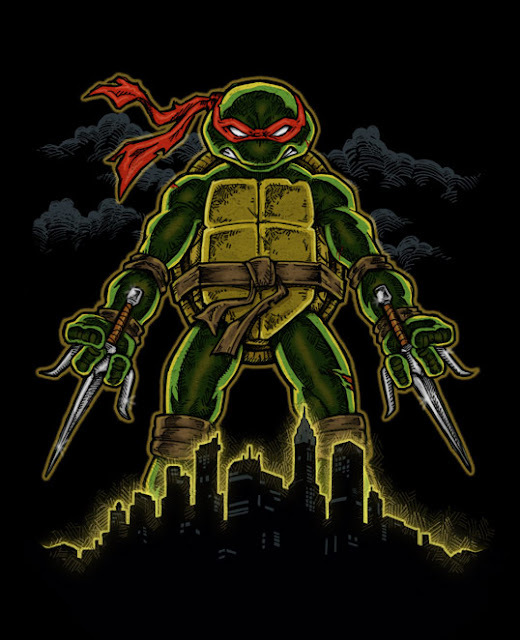 I've submitted a design for the awesome Threadless "Teenage Mutant Ninja Turtles" Shirt Competition. I'd love to have your vote to help get this design printed. The more "5's" it gets, the better chance it has to be chosen for print - I'd be very appreciative of your vote! Thanks for supporting me guys, and for visiting Springfield Punx! I've been voting on these shirts since it began and yours one of the best. First off, best Turtle out of the four, and secondly, it'd make a great shirt. Voted 5 right way. Love it. I appreciate that Ray, thanks! I would ware it. Haha, amazing picture. Ojalá puedas ganar el concurso, porque todos tus diseños son ESPECTACULARES !!! Thanks for saying so, jack!